Ophelia (we call her “Opie”) is Azimuth Psychological’s certified therapy dog. 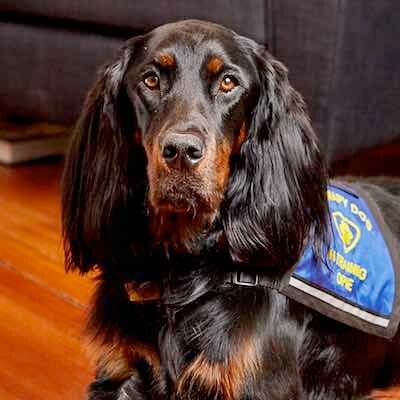 She is a Gordon Setter, a breed known for its kind, calm demeanor, loving brown eyes, and hypoallergenic coat! We like having Opie around because she is a champion cuddler and stress reliever! While she doesn’t join us in the office every day, you may see her wandering around trying to make friends. But don’t worry, if dogs aren’t for you, just let us know and we’ll be sure she is busy elsewhere during the time of your visit. Ophelia is also available on a limited basis for stress-relieving visits to your place of work.